Megaventory Blog - Online Inventory Management Software, Order fulfillment and Control System: Ecommerce support: Megaventory integrates Magento! 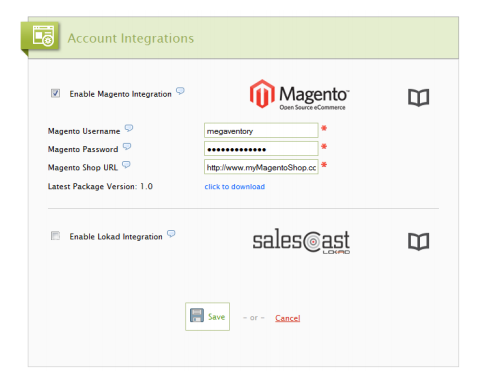 Ecommerce support: Megaventory integrates Magento! Just a month after our successful integration of Megaventory with Salescast by Lokad, we're ready to announce we've also integrated Megaventory with Magento, the popular open source e-commerce platform! So, if your business relies on the Magento platform, integrating it with Megaventory will bring superior inventory management while keeping your products synced across Magento and Megaventory over all your inventory locations. Alternatively, if you're actively considering taking your business online, now you have one more reason why you finally should take the step. Tracking inventory online will be easy if you choose the Magento approach, which is already the platform of choice for hundreds of thousands of ecommerce installations. Activating the integration is super fast as we've kept the number of steps small and intuitive. You can do it in the dashboard under the Admin menu in Account Integrations by filling in just a couple of fields. We have also put together a full Magento integration manual outlining the entire process and you can always contact us for clarifications.